Notes: The Warrington Bank Quay is located on the west side of the town from which it takes its name at the point where the former London & North Western Railway (LNWR) main line between London and Scotland running north/south (the present day West Coast Main Line) passed over the former St Helens Canal and Railway Company (SHC&RC) line between Garston and Warrington Arpley running west/east. At Arpley an end on connection with the Warrington and Stockport Railway created a through route between Garston and Manchester. The main line had opened on 4 July 1837 as part of the Grand Junction Railway. The SHC&RC line opened as far as Arpley on 1 May 1854 having reached a temporary terminus at Whitecross (west of Bank Quay) on 1 February 1853. The LNWR had gained effective control of the SHC&RC line by 1860 absorbing it formally on 29 July 1864. By this time the SHC&RC line was part of a through route between Liverpool and Manchester. was less than half a mile to the east of Bank Quay. They closed it when Bank Quay station opened but there was an immediate outcry from the citizens of Warrington as Arpley was much closer to the centre of the town. The LNWR were forced to re-open Arpley on 1 October 1871. 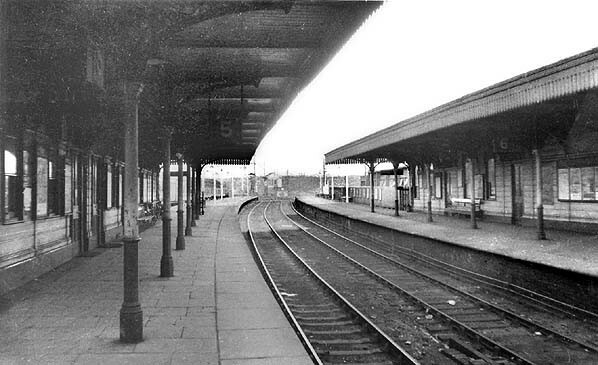 Warrington Bank Quay station had four through platforms on the main line with bays at each end. The main entrance was on the east side of the line. It was a large single storey brick building with a slate roof. The main line was elevated and the building was at street level. A subway ran under the main line and connected the platforms. On the former SHC&RC line which began to be referred to from this time as the 'low level line' (which it is still referred to as today). two through platforms were provided. At the east end of the up platform (Manchester direction) there was a bay platform that faced towards Manchester. The platforms were numbered 5 (the down platform), 6 (the up platform) and 7 (the bay platform). Collectively they were called the low level platforms but that was never an official title for the station. via the main station building. 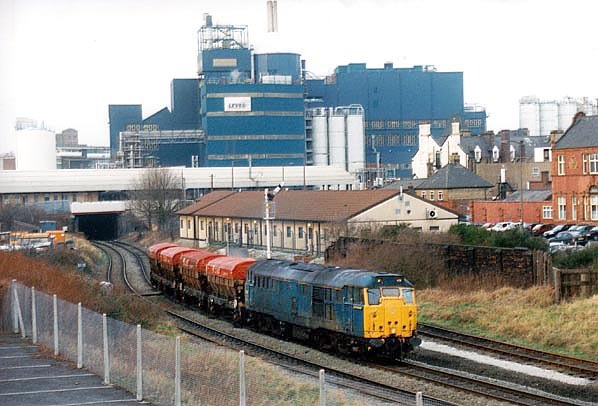 Although some longer distance trains served Warrington Bank Quay Low Level the majority were local services. The December 1895 time table showed a good service from the low level platforms of fifteen up and eleven down trains on weekdays as shown in the table below. On Sundays there were three up and three down services. By July 1922 the service remained at fifteen up and eleven down Mondays to Fridays as shown in the table below. On Sundays there were two up and three down trains. On 1 January 1923 Warrington Bank Quay became part of the London Midland and Scottish Railway (LMS). The LMS summer timetable for 1932 had fifteen up trains and thirteen down on weekdays with extra Saturday trains. On Sundays there were three up and four down trains. 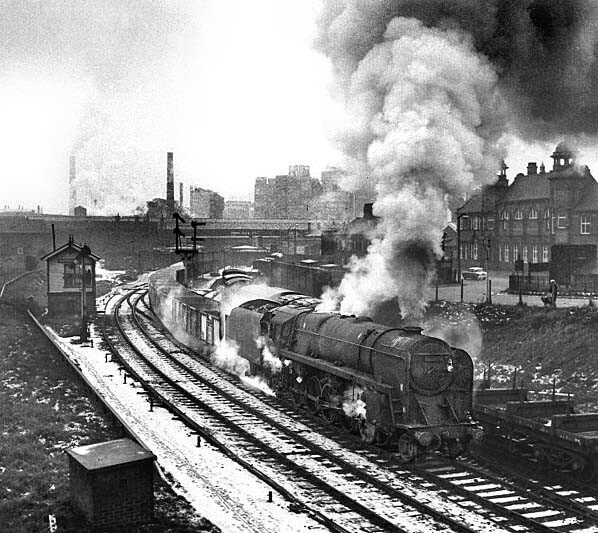 On 1 January 1948 the station became part of the British Railways (London Midland Region). In the first year of nationalisation the low level service had reduced to twelve up and only five down services between Monday and Friday with a couple of extra workings on Saturdays. There was only one train on Sundays which ran to York and departed at midnight. By October 1956 the service had reduced even further with only eight up and five down Mondays to Fridays. An extra up train ran on Saturdays. The Sunday midnight York train also continued to run. In 1958 DMUs were introduced onto the line and they resulted in a rise in passenger numbers. They were moved elsewhere though after a year and steam push and pull sets became the norm. included the trains that served Warrington Bank Quay low level. In 1959 the London Midland Region published a list of passenger services that it wished to withdraw and it included the trains that served Warrington Bank Quay low level. The timetable for the 18 June to 9 September 1962 showed only six up and three down trains running from the low level platforms Monday to Friday with an extra train on Saturdays. as shown in the table below. No westbound trains went direct to Liverpool Lime Street and the Manchester terminus had become Manchester Oxford Road. The midnight Sunday York train was still running. With a service as poor as that shown above it was little surprise that passenger numbers in 1962 were very low and many trains ran almost empty. The service was withdrawn on 10 September 1962 the last trains having run on Saturday 8 September 1962. The low level platforms at Warrington Bank Quay remained open as the Sunday York train continued to run. Only the up through platform saw regular use though. Rugby specials also called at the station. 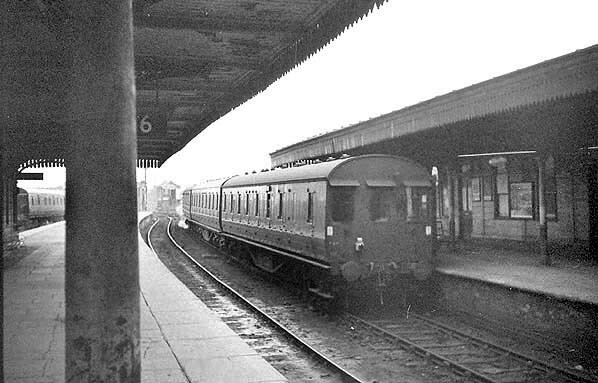 The last York train called at midnight on 17 July 1965. The following week it was diverted to run via another route and the low level platforms at Bank Quay closed. They had been demolished by the end of the 1960s. The line closed as a through route when the section between Latchford (east of Arpley) and Skelton Junction was taken out of use on 7 July 1985. A bridge over the Manchester Ship Canal was deemed to be in urgent need of repair and the costs would have been very high. British Rail decided to close the line instead of carrying out the repairs. 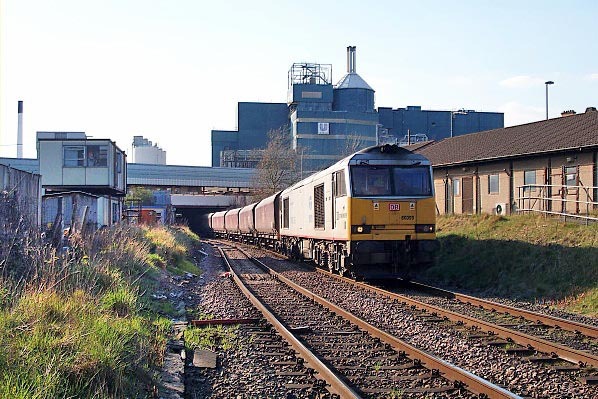 From warrington to Garston the line remained open and it was still a busy freight route in 2012 by which time the site of the low level platforms had become a locomotive crew changeover point. Warrington Bank Quay station continued to serve the West Coast Main Line but its main building was demolished and replaced with a modern structure in the early 1970s. Tickets by Michael Stewart and route map by Alan Young. The St Helens Railway, Its Rivals and Successors – J M Tolston – The Oakwood Press 1982. BR (LMR) Timetable May - Sept 1948. BR (LMR) Timetable June - September 1962. Warrington Bank Quay (Low Level) looking east along the up platform which was numbered as 5. 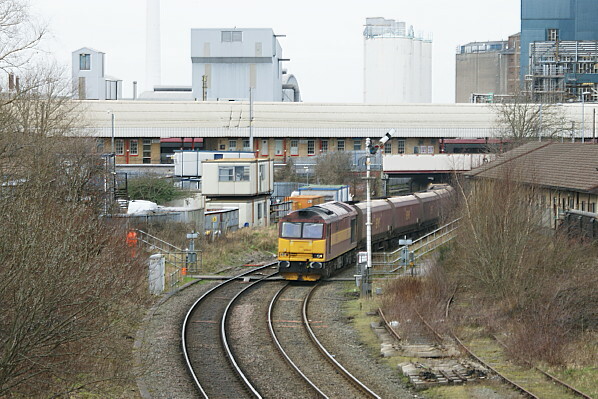 The low level part of Warrington Bank quay had three platform faces. To the right can be seen the down platform which was numbered 6. At the east end of platform 5 there was also a bay which was used by trains that ran between Warrington and Manchester only. Warrington Bank Quay station as it was in 1893. Click here for a larger version. 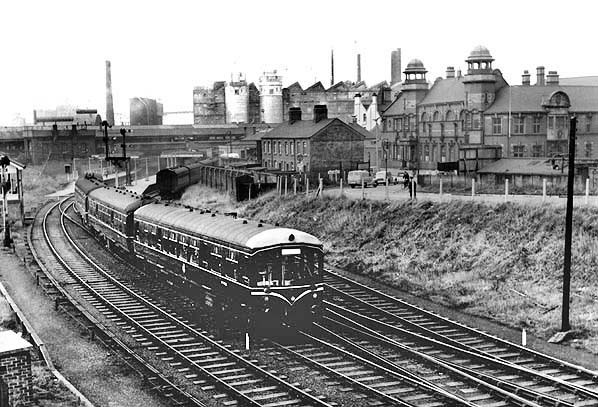 Looking west towards Warrington Bank Quay station in 1958 from the Slutchers Lane bridge. A Derby lightweight DMU is seen departing from the low level platforms and heading towards Manchester London Road. For a brief period in the late 1950s DMUs were introduced onto services between Ditton Junction and Manchester London Road but by the early 1960s they had been sent elsewhere and steam traction returned to all services on the line. A train for Manchester Oxford Road takes on water at the Warrington Bank Quay low level platforms in the summer of 1961. The fireman can be seen standing on the side tank of Ivatt 2MT Class locomotive number 41211 which was allocated to Warrington Dallam in April 1961. By March 1964, 41211 was on record as being on Bank Hall shed, where it was finally withdrawn in September 1966. 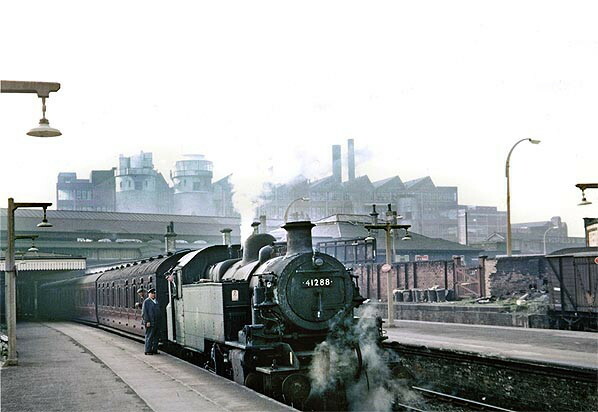 A train for Ditton Junction prepares to depart from Warrington Bank Quay in the summer of 1961. The train was being propelled by an Ivatt 2MT class locomotive number 41288 that was equipped to operate push and pull trains. Locomotive 41288 was withdrawn from Dallam in October 1962, just after the withdrawal of the local passenger service from Bank Quay low level. Warrington Bank Quay (Low Level) on 12 May 1962. A push/pull set has just arrived from the Manchester direction and is standing at the down platform. It would probably have gone on to Ditton Junction. 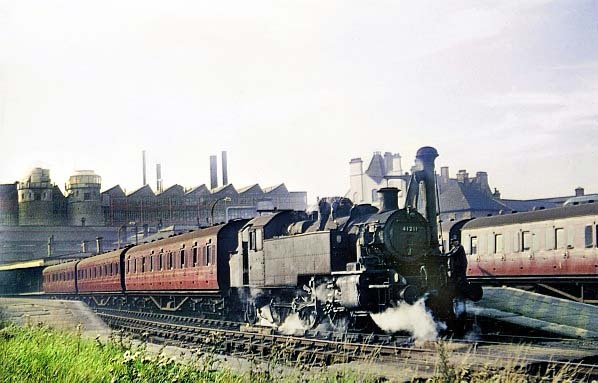 In the early 1960s a BR Standard Class 9F locomotive hauls a train of empty coal wagons through the Warrington Bank Quay low level platforms probably on route to the Yorkshire coal field. 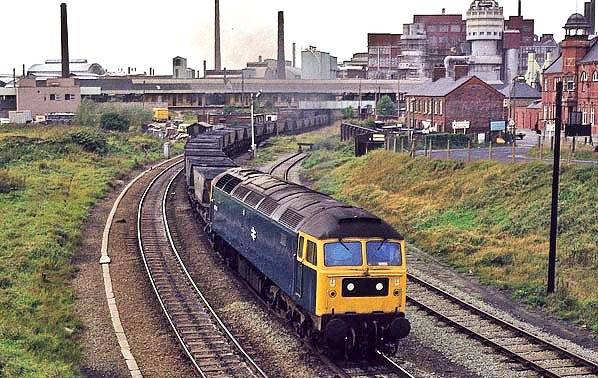 Empty MGR coal wagons are seen passing through the site of Warrington Bank Quay stations low level platforms hauled by a BR class 47 locomotive in the 1970s. A view looking west at the site of the Warrington Bank Quay low level platforms on 8 March 2012. The site of Warrington Bank Quay low level platforms looking west and seen from a point that would have been at the east end of the down platform on 5 April 2012. 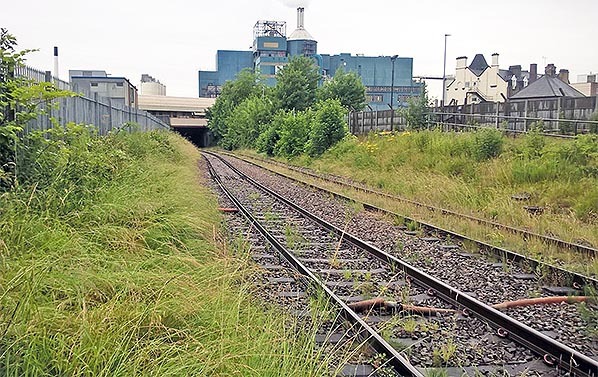 The site of Warrington Bank Quay low level platforms looking west in June 2017.